The rumors are true; MONSTREHERO is headed west! Cliff is going to Portland and I (sean) am going to Los Angeles. MONSTREHERO will still exist, but now we can work on opposite ends of the west coast, slowly conquering until we meet in the middle. So, as with most bi-coastal moves, one must part with certain material possessions to lighten the burden. We've decided to sift through our cavernous reserves of MONSTRE-goodness and find items that we think we can part with. Hence, the MONSTRE-GARAGE SALE. Starting this Sunday night, 3-15-09, we're going to have a bunch of older toys on super sale. 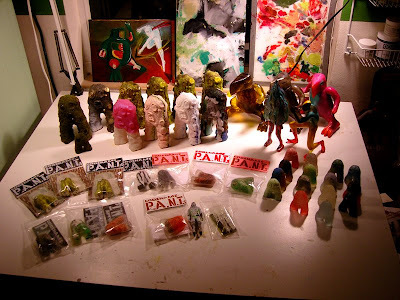 I'm talking $15 blindbag pantsmonstres here. Other deals abound, so if you've been holding off stuff, or haven't given resin a try, or want to spread the word, nows the time to do it! 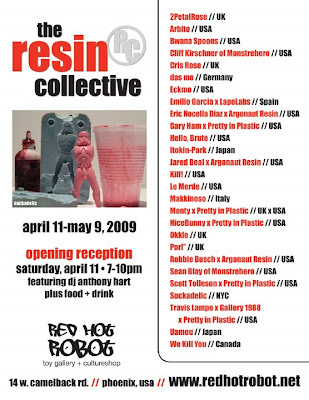 Here's a flyer for the upcoming "Resin Collective" Group Show at Red Hot Robot in Phoenix, AZ. Its going to be an awesome show. 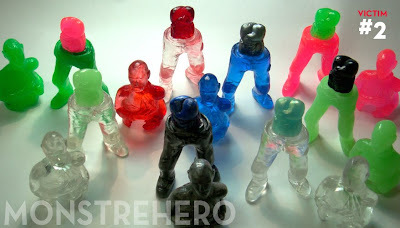 Every big name in resin is represented. and we're lucky enough to be included. Cliff and I are going to be submitting from ca-razy pieces, so be on the look out here and on the flickr for some sneak peeks in the next few weeks. Victim #2 is ready to make his long-awaited debut this Wednesday at 10 pm Eastern, 7pm Pacific! 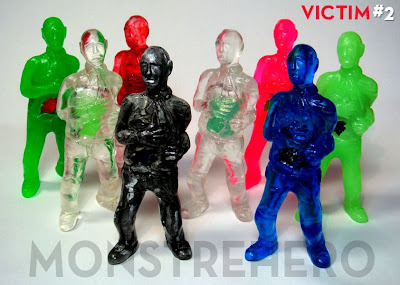 Check out the monstreshop this week to see the Victim in all his delicious flavors.